Indeed, this sun care product, contains broad spectrum photostable UVA/UVB filters and the patented Lumiwhite which associates new generation depigmenting ingredients to control melanogenesis. 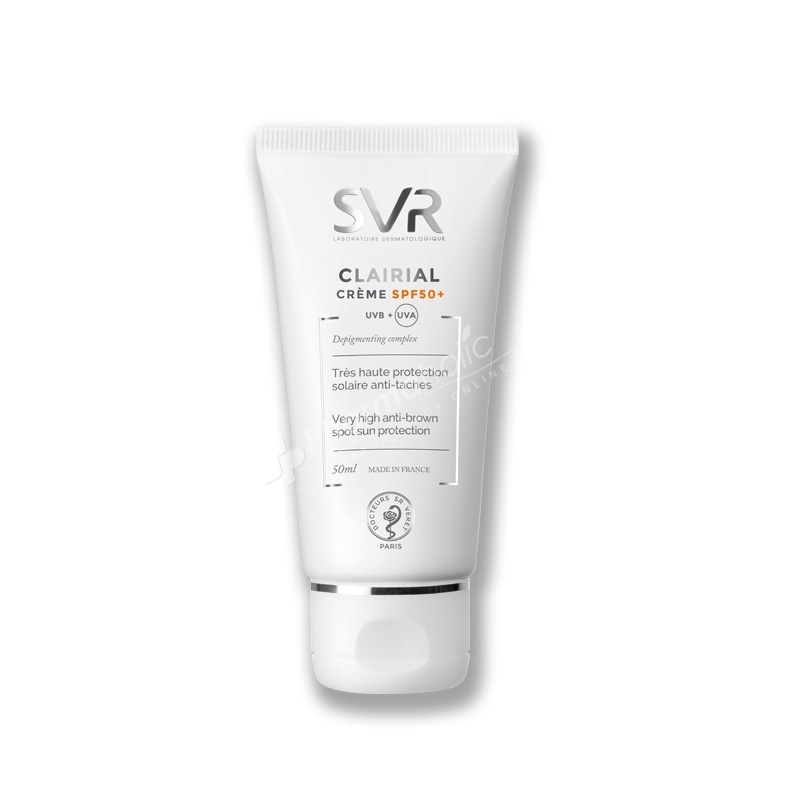 SVR Clairial SPF50+ Cream Brown Spots Very High Sun Protection reduces et prevents appearance of brown spots. Indeed, this sun care product, contains broad spectrum photostable UVA/UVB filters and the patented Lumiwhite which associates new generation depigmenting ingredients to control melanogenesis. Its texture spread easily without leaving white streaks. Can be won with makeup. Apply evenly in the morning. In case of exposure to sun, reapply frequently. Aqua, Ethylhexyl Methoxycinnamate, Dibutyladipate, Homosalate, Methylene Bis-Benzotriazoyl Tetramethylbutylphenol, Diethylamino Hydroxybenzoyl Hexyl Benzoate, Tridecyl Salicylate, Titanium Dioxide, Polyglyceryl-3 Methylglucose Distearate, C12-15 Alkyl Benzoate, Glycerin, Bis-Ethylhexyloxyphenol Methoxyphenyl Triazine, Caprylic/Capric Triglyceride, Dicaprylyl Carbonate, Decyl Glucoside, Behenyl Alcohol, Ethylhexylglycerin, Undecylenoyl Phenylalanine, Diethylhexyl Syringglydenemalonate, Butylene Glycol, Potassium Cetyl Phosphate, Glyceryl Stearate, PEG-100 Stearate, Tomethamine, Tocopheryl Acetate, Alumina, Palmitoyl Proline, Stearic Acid, Xanthan Gum, Disodium EDTA, Hydroxyethyl Acrylate/Sodium Acryloyldimethyl Taurate Copolymer, Palmitic Acid, Isohexadecane, Magnesium Palmitoyl Sarcosinate, Propylene Glycol, Polysorbate-60, Sorbitan Isostearate, Oligopeptide-68, Diacetyl Boldine, Tocopherol, Hydrogenated Lecithin, Sodium Oleate, BHT, Chlorophenesin, Methylisothiazolinone.